Home » Posts tagged "Sonos Play 5"
Press the Mute (now Play/Pause) button on a Sonos speaker to toggle between playing and pausing the audio in a room (defaults to restarting the same music source unless a new source is selected). Add a player to a room group – when you ungroup, you’ll see the content that was in the music queue prior to it being grouped. Mute one player in a room group – press and hold the volume down button on a player to quickly reduce it to zero volume while the rest of the players in the group continue unaffected. Update to release 4.2 to enable effortless support for PLAY:1, the newest wireless Sonos speaker that delivers deep, crystal clear HiFi sound. Sonos offers support for more than one household so you can easily enjoy Sonos wherever you have access to a Sonos system. Select Add Another Sonos System from the Settings menu when you are prompted to connect to a household. Once you add the household, it will automatically connect as you move from one place to another. To remove a household from your controller, select Forget Current Sonos System from Settings -> Advanced Settings. Want to let the world know what you are listening to? Share straight from within the Sonos Controller for iPhone and iPad to Facebook, Twitter or any other installed and supported app. Hear a track you like? Star a Spotify track from within the Sonos Controller so you can easily retrieve it for playback later. Artist name now appears under track name when viewing a compilation album. Pandora radio stations now display artwork. Daylight Savings Time (DST) is supported for the Jerusalem time zone. Paired with a PLAYBAR, a CONNECT:AMP and speakers can be configured for use as left and right rear surround channels in your Sonos surround sound experience. This feature was designed for installers and therefore setup takes place outside the Sonos app. Refer to the CONNECT:AMP product guide for setup instructions. Still use your CR100 for everyday use? Our goal remains to support the everyday use of your CR100 as long as we possibly can. Compatible with iPhone, iPod touch, and iPad. iPhone and iPod touch require iOS 4.0 or later. iPad requires iOS 5.0 or later. Mac running OS X v 10.6.8, or v10.7, or 10.8. 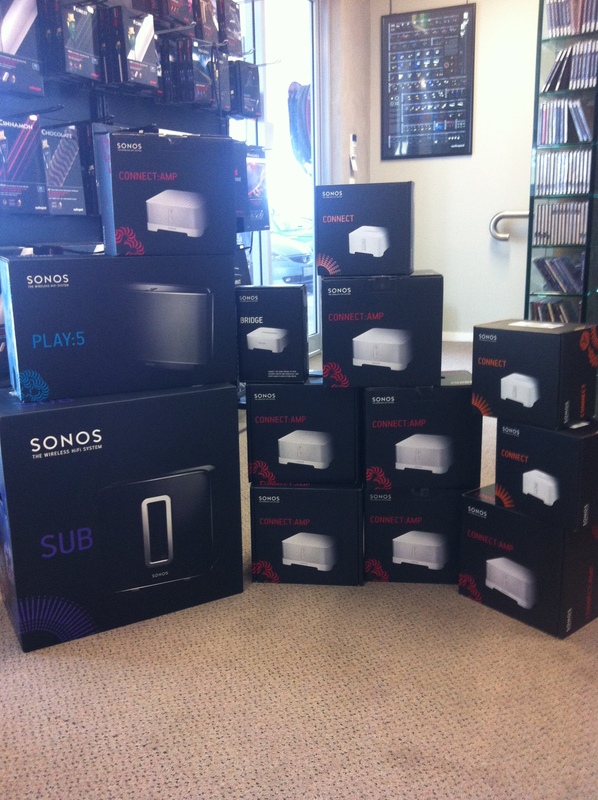 Another day, another Sonos installation.